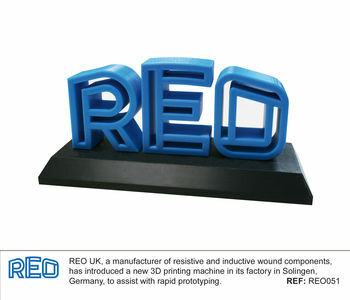 The first job for REO's newly installed printer was to produce a three-dimensional logo for the company. At the time of writing, the printer had also been used to produce a sample front panel of a REOVIB controller, incorporating some bespoke design. The sample is currently with a customer and has already received some positive feedback. Also referred to as additive manufacturing, 3D printing is a process that produces a three-dimensional, solid object of virtually any shape using a digital blueprint. This is realised through an additive process, where successive layers of material are laid down in different shapes. Additive manufacturing has been used for the past twenty years in a variety of industry sectors such as architectural modelling, industrial design, automotive, aerospace, military, engineering, civil engineering, dental and medical industries, human tissue replacement, fashion, footwear, jewellery, eyewear, education, and many other fields. However, it is only in the last two to three years that its effectiveness has improved to the point where it has become, not only a regular part of industry, but also a regular feature in the consumer media. This kind of prototyping is considered more precise than traditional machining techniques, which mostly rely on the removal of material by means of cutting or drilling. With 3D printing you just need a CAD (Computer Aided Design) plan and then layer by layer, the item is printed. "During my last trip to Germany I witnessed the 3D printing of the REO logo," Steve Hughes, marketing manager of REO UK enthused. "I was surprised at how quick and accurate the whole process was. I believe that additive manufacturing will have a positive impact on production and will definitely shorten time to market," he finished. As an original manufacturer of high-quality power equipment, REO's products are used in applications ranging from renewable energy technology and electronic controllers, to electrical regulators. The quick turnaround enabled by 3D printing is expected to improve product evolution, company focus and morale, as well as customer relationships.